Raven is the common name for several bird species in the taxonomic genus Corvus. 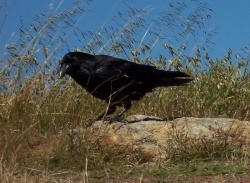 Ravens are very similar to crows, but there are a few minor anatomical differences. First, crows' beaks are smaller, along with their tail feathers. Ravens typically have shaggier neck feathers, appearing almost furry from a distance. The Raven is one of the few animals mentioned specifically in the Bible. Their reference shows that the Raven is a created kind, without changing much over the course of time. However, it would still be speculative whether the crows belong to this Kind also, or perhaps the entire Family Corvidae. Gen 8:6-7 6 After forty days Noah opened the window he had made in the ark 7 and sent out a raven, and it kept flying back and forth until the water had dried up from the earth. The Raven is the largest bird in the Passerine order, able to grow up to 69 cm in length. Males are not much different from the females, though the female might be a bit smaller. Both genders are known for their iridescent black feathers covering their bodies, with a bluish hint in the light. Ravens are distinguished from other birds in the Corvus Genus (such as the crows) by their wedge-like tail, large beak, hackles (shaggy neck feathers), and their tendency to soar in flight. The organs of the raven are similar to any other birds, their features no different than any other in Passeriformes. The Raven's call is a harsh system of croaks, though their intelligence allows them to imitate sounds they hear(like parrots) to the point where they can actually imitate human words. In captivity, the Raven survives well. One such bird was recorded to live up to 69 years of age. The Raven reproduces sexually, one male and one female, to produce offspring. Once fertilized the female lays several (3-7) eggs, which hatch after a period of time, and both parents take turns feeding the chicks. Ravens tend to stay with the same partner for life, even mourning their partner for up to two weeks after once killed, or dead. 'Adultery' in the Raven world is not uncommon, as the Ravens do not always keep a monogamous relationship with their partner. The pair will usually live in the same place year after year unless forced out of it by man, or another threat. Common raven (Corvus corax), North America, California. On the cliffs in Marin Headlands, N California coast. 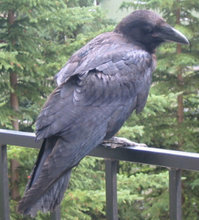 The Raven lives in a variety of habitats, being very adaptable to new or harsh climates. Ravens can be found in parts of the northern tundra to barren mountains. Raven's nests are typically unkempt constructions of twigs, lined with shredded bark, or sometimes hair. The birds are omnivores, and their diets consist of insects, grains, some rodents, and even another bird's eggs. The Raven is a solitary creature, though it will occasionally feed with other birds in small flocks. This page was last modified on 14 August 2014, at 20:36.